Axis Bank Virtual Debit Card: How To Get For You Within 2 Minutes? How To Create Your Own Axis Bank Virtual Debit Card Within 2 Minutes & Get All These Benefits? Being an one-stop destination for all your shopping & saving needs, we always try to keep more tips and tricks which you can use to save more money while shopping online. And I think, most of you have already seen that, two biggest e-commerce giant in the country Flipkart and Amazon as well some of the other popular online shopping store is providing huge discount on wide range of products on online payments done via Axis Bank cards. So, today, we are going to share the steps which can give you a free Axis Bank Virtual Debit card within few minutes. Then you can use it to shop online and get instant discounts on appropriate product purchases. Do you know? 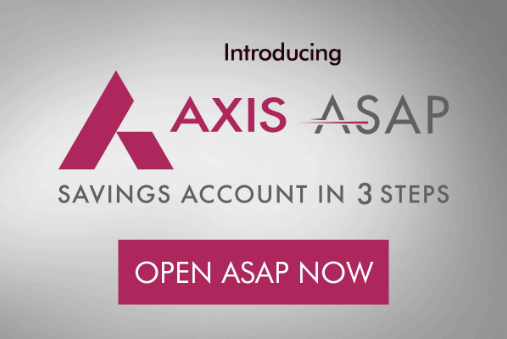 Axis bank now gives you an option to create your own zero balance account in Axis bank within few minutes? Yes! Believe it or not, now it’s possible with Axis Asap account. Not only that, even in zero balance, it also provides Axis Asap Virtual Debit card. So, until this option is available, all the online shoppers should create Axis Asap account for them. After all, it’s completely free and you can even have zero balance in your account. You can have absolutely Zero balance which need no investment. Create your account within minutes, it won’t take much time of yours. Get Rs 100 free recharge as cashback from FreeCharge. Also get Rs 150 cashback when you book using BookMyShow. Avail up to 10% instant discount on various products at Flipkart and Amazon. Enjoy mobile banking and net-banking benefits without spending money. Now, you can clearly see that there are lots of benefits and advantages available with this Axis Bank Virtual Debit card. So, don’t wait and get now for your own within minutes and keep enjoying all these benefits. Bonus Benefit: Creating a bank account and getting a virtual debit card usually takes time because to create an account, you need to provide a lot of documents and visit your nearest bank. But with Axis Bank Asap Account, you don’t any of these things. You can easily create your Axis Asap account and start using the services right away. No hassle no time waste. How To Create Axis Asap Account Within 2 Minutes? Firstly, go to the Axis Bank Official Website here. Enter your mobile number which is linked with your Aadhaar card. Then enter your Aadhaar number which is associated with your given mobile number. And type your PAN card number. Check mark on “I agree….” and click on “Next” button. There you need to enter your City and an OTP will be sent to your mobile number. Enter the one time password and verify it. That’s it, you now have your own Axis Asap account with your Axis Bank Virtual Debit card. Now you can use it according to your need and you can avail the benefits mentioned above. Enjoy! How To Avail FreeCharge Axis Bank Offer & Get Cashback Using Axis Bank Virtual Debit Card? Firstly, initiate any recharge worth Rs 100 or more. Apply the FreeCharge promo code – AXIS. Then pay using your Axis Bank Virtual Debit card and that’s it. 100% cashback worth Rs 100 will be given back to your FreeCharge wallet. This offer is available till 30th September 2018. So hurry up! How To Get Rs 150 Cashback From BookMyShow Using Axis Bank Virtual Debit Card? Select your desired seat at cinema hall online. Book at least two movie tickets from there making the total spending amount at least Rs 500. At the time of payment, select “Axis Bank Asap Offer” option. Then make the payment using your Axis Bank virtual debit card and that’s it. You will get your Rs 150 cashback within few hours. Enjoy! Hope you guys liked this article about Axis Bank Virtual Debit card creation and it’s benefits & offers. You can use this virtual debit card for payments at Flipkart and Amazon as well to receive instant discounts on various products. If you still have any query about this, please let us know in the comments below.